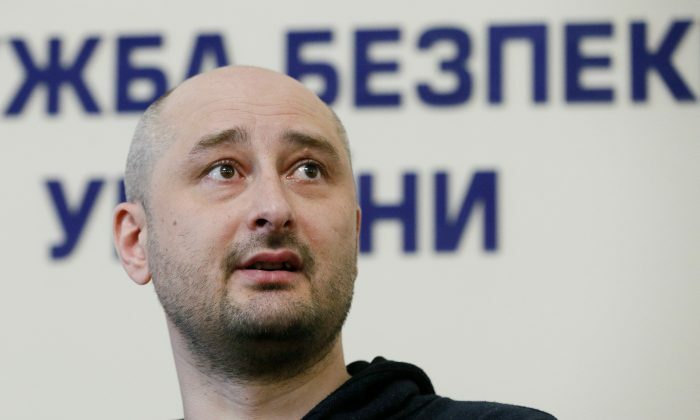 KIEV — Dissident Russian journalist Arkady Babchenko said on Thursday he collaborated in a plot to fake his own death because he feared being targeted for assassination like former Russian spy Sergei Skripal. He played dead, he said, while medical teams — who were in on the ruse — took him to hospital in an ambulance and then certified him as dead and sent him to a morgue. Late on Thursday, a Kiev court ordered the detention of a man who Ukrainian prosecutors say was involved in the plot and who had handed over $15,000 to a would-be killer. “I got a call from a longtime acquaintance who lives in Moscow, and in the process of communicating with him it turned out that he works for the fund of Comrade Putin precisely to orchestrate destabilisation in Ukraine,” he said. “No one is angry, unlike some in other places, but we hope(Ukraine) understands that international goodwill is a finite resource – even if they are right and it’s a war against a superior enemy,” the diplomat wrote to Reuters in a message.